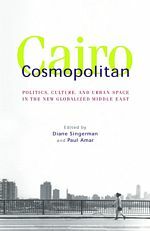 in Amar P. and Singerman D. (eds), Cairo Cosmopolitan : Politics, Culture, and Urban Space in the New Globalized Middle East, The American University in Cairo Press (2006), ill., p. 489-511. Voir les détails sur cet ouvrage sur le site web de l’American University in Cairo Press. The crowd is dense, circulating around the exhibits, eddying between the monkey cages and the barriers that protect the patches of lawn. 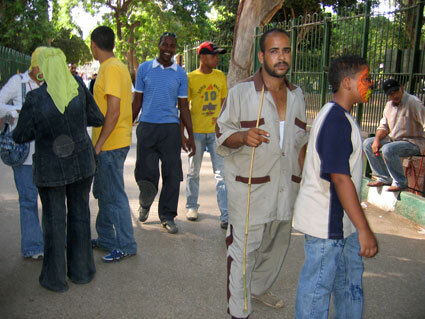 It is the second day of post-Ramadan holidays at the Giza Zoo. Hundreds of picnicking families and romantic couples get up from off lawn that is technically “closed to the public.” Using a thick black hose, a zoo gardener inundates the area with a spray of water. “Move out ! Stay outside !” But hardly has he turned his back to pick up some trash, when visitors again cross the border of this little island of green, walking with precaution toward the center of what is now a marsh in the middle of which rises a floral composition of palms and cement. Among the adventurers, two young couples : the boys are carrying cameras, and the two girls wearing head-scarves pick up their long skirts a little in order not to spot them with mud. Together, the two girls pause in front of the palms, but this is only the preliminary to a more studied pose. The competing adolescents are already monopolizing a useful part of the decor (the trunk of a dead tree) : “Give me my dark glasses for the photo !” One of the couples decides to pose farther away, where the sunlight of the end of the day pierces some foliage. The boy and the girl lean symmetrically on one of the park’s floral lamps ; the plants form the backdrop. The girl readjusts her blouse, smooths down her dress, straightens the pleats of her skirt and, finally, immobile, both of them look straight ahead at the camera lens. A little ill at ease, the boy only brightens his expression at the instant of the flash. The girl, gently smiling, seems defiant. Following the flash, the pose is kept a few seconds too long. Then all seem relieved. Giza Zoo, Cairo. 2nd Sept., 2005. Et maintenant en : Le zoo de Gizeh : Se réapproprier des espaces publics, réinventer une esthétique urbaine (The Giza Zoo : Re-Appropriating Public Spaces, Re-Imagining Urban Beauty). Cet article a été lu 6676 fois. Dernière mise à jour de cette page le jeudi 3 juillet 2014 à 20:21:20. //// -----> Citer cette page? 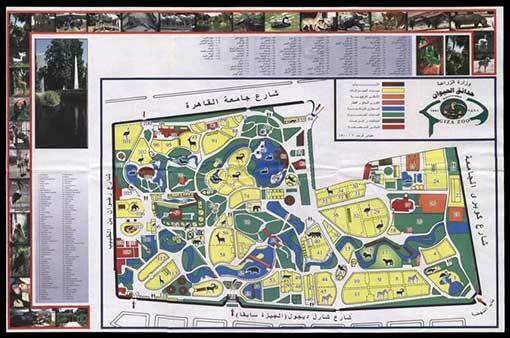 Vincent Battesti, "The Giza Zoo : Re-Appropriating Public Spaces, Re-Imagining Urban Beauty" [en ligne], in vbat.org anthropoasis, page publiée le 6 juin 2006 [visitée le 18 avril 2019], disponible sur: http://vbat.org/spip.php?article37.